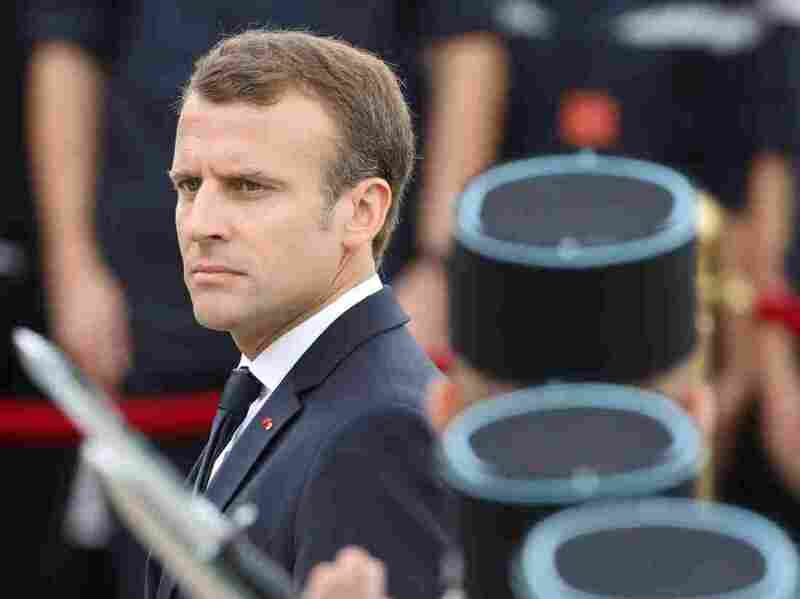 France Plans Revival Of Compulsory National Service On the campaign trail, French President Emmanuel Macron first proposed bringing back national service, which was phased out in 1996. French President Emmanuel Macron reviews French army soldiers during a ceremony commemorating General Charles De Gaulle's June 1940 appeal to French resistance against Nazi Germany, earlier this month, at the Mont Valerien national memorial in Suresnes, outside Paris. The French government has a plan to revive compulsory national service for young people between the ages of 16 and 21 — a watered-down version of a proposal put forth on the campaign trail by then-presidential candidate Emmanuel Macron. Under the plan, French boys and girls would do a minimum of one-month of service, with a focus on "teaching, working with charities, and traditional military training with the police, fire service or army," Euro News reports. "They can then volunteer to do a further three months to a year after that, which could involve an area linked to [defense] and security, or more volunteer work," the news service says. Even so, the plan is a toned-down version of what Macron proposed in 2017. His initial idea was "a sort of military service in miniature, with all French citizens forced to have a 'direct experience of military life' for a minimum of one month between the ages of 18 and 21," according to the BBC. In modern France, national service — including military conscription for all fit males – dates back to the years leading up to World War I, when the French military tried to keep pace with the growing German Imperial Army. Conscription was continued following World War II and was only phased in 1996. When it ended, the requirement was for males only to serve a minimum of 10 months. France24 says the new Service National Universel plan would affect 750,000 French teens each year. France's Minister of Education Jean-Michel Blaquer, told journalists on Wednesday that the one-month service would involve civic education, first-aid training and army information sessions, according to France24. Young people between the ages of 16 and 25 would have the option for a second phase lasting anywhere between 3 and 12 months that will focus on culture, defense, the environment or tutoring, the news service says. The U.K.'s Guardian newspaper noted in February that Macron's campaign promise was "seen as a way of playing up a kind of patriotic nostalgia for military service at a time of increasing social divides in France." "People in France have mixed feelings about the plan. One criticism is that it would cost France too much and overburden the military, which is already stretched thin by anti-terrorism operations in the Middle East and Africa, as well as patrols against jihadists back home. Before the plan was announced, several youth [organizations] objected to what they called inconsistencies, and that young people should be free to choose if they want to participate. Macron is the first French president not to have done military service as he came of age after the practice was scrapped in 1996." A poll taken in 2015 found that 80 percent of the French favored a return of compulsory national service as a tool "to help promote integration, mix young people of different social backgrounds and levels, and to [instill] Republican values and national cohesion."